For solar projects in the Mojave Desert in general, see Solar power plants in the Mojave Desert. The plant was commissioned on 1 December 2014. 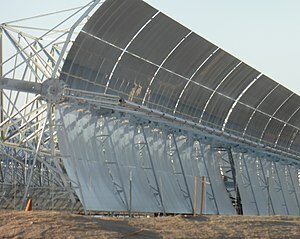 The array of parabolic troughs at the Mojave Solar Project site in their stow position. Using the desert's solar thermal energy, the facility generates steam in solar steam generators, which expands through a steam turbine generator to produce electrical power from twin, independently operable solar fields, each feeding a 125 MW power island. Generation is provided 100% from sun, no supplement from fossil-based energy sources. There is a gas-fired auxiliary boiler, for each field, only to provide equipment and heat-transfer fluid (HTF) freeze protection, when temperatures fall below 54 °F (12 °C). The details of the parabolic trough used in the project. The power cycle is a Rankine-with-reheat thermodynamic cycle from heat supplied via heat-transfer fluid, solar field heated up to 740 °F (393 °C). When operating, the transfer fluid enters the solar field at about 520 °F (271 °C). The steam generator steam exit temperature is about 720 °F (382 °C). Each field utilizes 1128 solar collector arrays (SCA) sited on about 710 acres (290 ha). Each SCA, model E2 from Abengoa (derived from Luz's LS-3), is 125 metres (410 ft) long and is made of 10 solar collector elements (SCE), 12 metres (39 ft) long each and 5.76 metres (18.9 ft) aperture. The E2 steel frame collector with monolithic glass reflector panels, yields a total aperture area of 691.2 square metres (7,440 sq ft). That makes a total of 779,674 square metres (8,392,340 sq ft) aperture each solar field, 1,559,347 square metres (16,784,670 sq ft) total for the plant, operating about 3,024 hours per year. Cooling is provided by wet cooling towers; water for the towers and solar collector washing, is supplied from onsite groundwater wells. Water from condensed steam exits the cooling tower pump at about 80 °F (27 °C), before cycling back to the steam generator. Mojave Solar Project production is as follows (values in MW·h). ^ "The Center for Land Use Interpretation". Clui.org. Retrieved 18 July 2018. ^ "US government backs Abengoa's solar project with $1.2 billion loan guarantee". Energy Efficiency News. 19 September 2011. ^ "Abengoa Solar, Inc. (Mojave Solar)". Loan Guarantee Program. DOE. Archived from the original on January 27, 2012. Retrieved February 7, 2012. ^ "Loans - Award Summary: Mojave Solar LLC". U.S. Government. Retrieved 26 August 2013. ^ "Advice Letters 3876-E and 3876-E-A" (PDF). California Public Utilities Commission. January 11, 2012. Retrieved February 7, 2012. ^ "Abengoa puts 250 MW CSP array online in California". Industry Dive. Retrieved June 28, 2015. ^ a b "Mojave Solar Project, Monthly". Electricity Data Browser. Energy Information Administration. Retrieved March 8, 2017. "Mojave Solar Project". Plants under construction. Abengoa Solar. Retrieved February 7, 2012. "Abengoa Mojave Solar Project". SolarPACES. National Renewable Energy Laboratory (NREL), U.S. Dept. of Energy (DOE). October 20, 2011. Retrieved February 7, 2012. "Abengoa Mojave Solar Project Power Plant Licensing Case". California Energy Commission. July 18, 2011. Retrieved February 7, 2012. 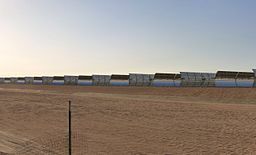 "Abengoa Mojave Solar Power Plant (CACA 52096)". Renewable Energy Priority Projects. Bureau of Land Management (BLM), Dept. of the Interior (DOI). July 15, 2011. Retrieved February 7, 2012. This page was last edited on 2 April 2019, at 04:44 (UTC).